Thanks. I also added the hard folding cover, Undercover Flex. Also added Husky mats and husky mudguards front and rear and bought a tray for inside console. Thanks. Time will tell how this one holds up. My 02 does have the 5.3 and 3.73 rear. The new one is 5.3 and 3.42. The new one is definitely faster and does want to rev easier than the 02. You have to push the 02 to get above 2500 RPMs and the new one will easily hit that or 3K with not much effort. I do have the eight speed trans which shift nicely. Finally decided to buy a new truck after having my 2002 Silverado 1500 2 wheel drive since new, bought in April of 2002. I hope this new one is as reliable as my 2002 is which I still have and is used as a daily driver. If anyone is interested, here are the repairs performed to the 2002 and what is still original and has not needed repair. Currently have 155K miles and I do all the work myself and keep all records. Other than normal maintenance items like filters, the following have been replaced, Both front wheel bearings Only had 1 alignment performed Brake Pads front/rear-Twice A/C Mode Control Damper Actuator A/C Recirc Control Damper Actuator failed and I wired it to stay closed about 12 years ago. Driver Side Door Lock Switch Spark Plugs/Fuel Filter Serpentine Belt and A/C Compressor Belt A few fog light bulbs Worst issue was I had my transmission go out at 90K miles. Sun shell failure inside trans. I had a shop remove/rebuild trans and has been fine since. I believe some 02 models had issues with sun shell failures. Knock on wood, still have original alternator, fuel pump, water pump, power window/lock motors and the A/C has never needed Freon and has never been touched. Still have original plug wires and coil packs. The 02 models and others around this age had many complaints of cold start piston slap. Mine did have this but it basically has gone away after all this time and runs great. I do all my oil changes at 3K miles using Castrol 5w-30 GTX and AC Delco filter. Uses about 1 quart per 3K miles. 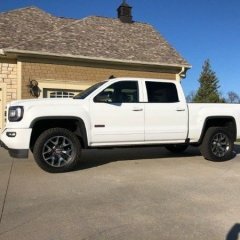 For the new truck, I bought a 2018 GMC Sierra 1500, Z71, 5.3, 8 Speed, SLT Premium Plus package. Nice to have steering wheel controls, blue tooth, heated/cooled seats and other nice features that didn't exist in 2002. Other than obvious improvements between these trucks, I wish the new one had a few items that I know they quit installing on these over the years such has glove box lighting, under hood lighting and lighting around the floor board. My 02 you can still rev the engine under the hood with the throttle cable. RyanBab, I remember you having a truck similar to my 02 that was blue back then. I believe yours was a 4x4. Anyways again I hope this one performs as well as my old one has. Thoughts on break pads and rotors ? I went with the Akebono pads also on the wife's trail blazer. No issues and very little dust. Had the sunshell strip out in my 02 at about 95k. I see it in the picture but can't tell, I thought they where modified by 05.